Above: Eduardo Ciannelli in a publicity portrait from one of his first films, Winterset (RKO, 1936). Eduardo Ciannelli was one of the most frightening of screen villains. Hard-featured, with a piercing stare and a cruel smile, Ciannelli could have given audiences nightmares with his face alone; his voice was also exceptionally sinister–low and silky, but with an undercurrent of mocking malice in it. Ciannelli lent his talents to many a feature–the most notable being George Stevens’ classic Gunga Din, in which he was terrific (and terrifying) as the demoniacal leader of the Thuggee cult. He also made his devilish presence felt in three serials, the first of which emerged as one of the genre’s best, thanks in large part to Ciannelli’s expert performance. Eduardo Ciannelli (pronounced Chee-uh-nelli) was born in Ischia, Italy, the son of a doctor. He followed his father’s career path at first, graduating from the University of Naples with a physician’s degree, but he subsequently abandoned his career in medicine for one in grand opera. After achieving some prominence as an operatic baritone, he branched out into dramatic acting. He established himself as a notable performer on the European stage, and moved to the American stage in 1919. He played important roles on Broadway throughout the 1920s, including parts in the original productions of The Front Page and Reunion in Vienna; in 1933 he made his screen debut, recreating his stage role (that of a loyal old servant) in MGM’s movie version of Vienna. However, he remained primarily a stage actor until 1936, when he began his film career in earnest in RKO’s screen version of Maxwell Anderson’s play Winterset. In Winterset, Ciannelli portrayed the gangster Trock Estrella, another role he had originated on Broadway, and firmly typed himself as a heavy in the minds of Hollywood producers. The next several years saw him cast as menaces in pictures ranging from the Jack Oakie comedy Super Sleuth and the B-thriller Bulldog Drummond’s Bride to the aforementioned Gunga Din and Alfred Hitchcock’s Foreign Correspondent, although he occasionally managed to break from the villainous mold to play sympathetic or even comical character parts in films such as Strange Cargo and Kitty Foyle. In 1940, Republic Pictures hired the now well-known Ciannelli to headline the cast of his first and best serial. Mysterious Doctor Satan (Republic, 1940) featured Ciannelli in the title role, that of an evil scientist who was determined to conquer the world with a robot army. The key to Dr. Satan’s plans was a “remote control cell” developed by Professor Scott (C. Montague Shaw), but his attempts to procure Scott’s invention were continually thwarted by hero Bob Wayne (Robert Wilcox), who assumed the guise of the masked “Copperhead” to battle the bad doctor. William Witney and John English, the directors of Mysterious Doctor Satan, injected the serial with an atmosphere of brooding menace that gave additional urgency to its many action sequences, an atmosphere that was greatly augmented by Ciannelli’s top-billed performance. He preserved a sneering calm as he electrocuted untrustworthy henchmen, threatened upstanding scientists, and performed other evil deeds; his calm only occasionally gave way to a fanatical intensity, usually when he rhapsodized about the power of his projected robot army. This self- possession made his character’s standard mad-scientist machinations seem far more threatening than any amount of megalomaniacal ravings would have done. Though Mysterious Doctor Satan was an excellent serial in many regards, it was Ciannelli’s frightening performance that lifted it into the ranks of Republic’s best. 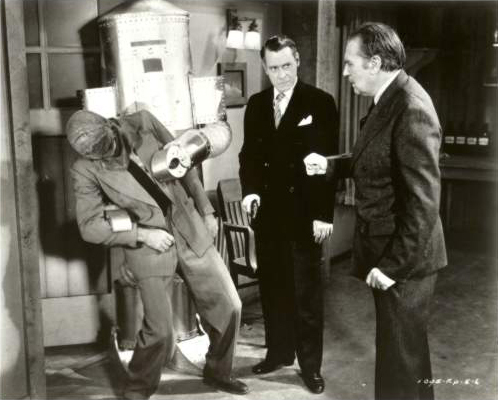 Above: Eduardo Ciannelli (center) demonstrates his robot for C. Montague Shaw in Mysterious Doctor Satan (Republic, 1940. That’s the Copperhead (Robert Wilcox) in the grasp of Ciannelli’s metal monster. 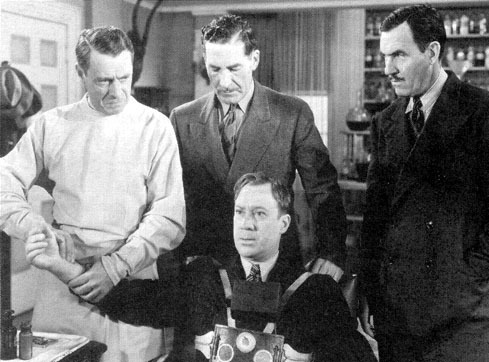 Above: Eduardo Ciannelli outfits a hypnotized William Newell with an explosive vest as Joe McGuinn (center) and Walter McGrail (far right) look on in Mysterious Doctor Satan. Ciannelli’s second serial, Sky Raiders (Universal, 1941), was released not long after Doctor Satan. In this cliffhanger, he played Felix Lynx, an international spy of who was out to steal a new pursuit plane developed for the US Air Force by former flying ace Captain Robert Dayton (Donald Woods). Sky Raiders, a high-quality but unusual serial, placed less emphasis on the tradition hero-villain duel and focused chiefly on the relationships between the good guys–hero Woods, his best friend Robert Armstrong, his protégé Billy Halop, and his secretary Kathryn Adams. Of the villains, Jacqueline Dalya as Ciannelli’s female associate had the most screen time, and Ciannelli was largely a background figure throughout the serial. However, he did a fine job in his role, eschewing the sadistic malevolence he had displayed as Dr. Satan in favor of a combination of suave sophistication and snappish irritability; his character here was a high-living scoundrel who performed his villainous deeds in a businesslike manner, apparently regarding them as necessary to the maintenance of his plush lifestyle. 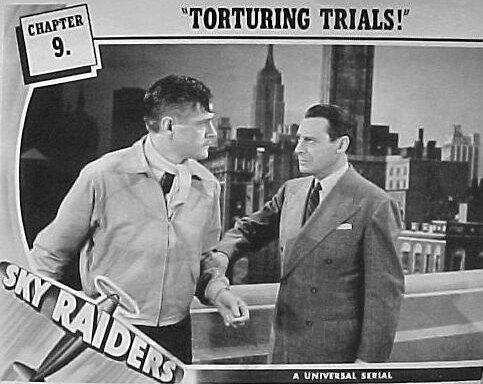 Above: Eduardo Ciannelli confronts Donald Woods (left) in Sky Raiders (Universal, 1941). 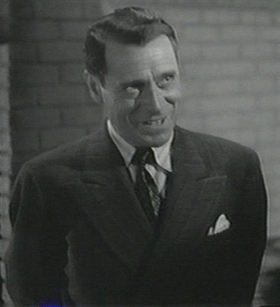 The 1940s saw Ciannelli continuing his career as a (usually sinister) character actor in features, but he made one more serial appearance in Adventures of the Flying Cadets (Universal, 1943). This time, he was Carl Von Heiger, a Nazi agent who joined American turncoat Arthur Galt (Robert Armstrong) in a plan to procure militarily valuable helium deposits in the African jungle. Their plan was opposed by the cadets of the title, four young student pilots (Johnny Downs, Ward Wood, Bobby Jordan, and Billy Benedict) who pursued the spies to their jungle headquarters. Flying Cadets was an involving wartime adventure, and gave Ciannelli a fine villainous showcase– although his co-villain Robert Armstrong’s part was somewhat meatier than his was. 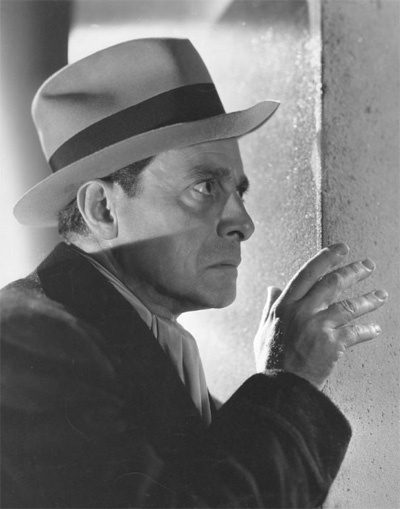 Ciannelli’s hard and merciless face and his foreign accent (Italian, of course, but slight enough to pass for a German one) made him ideal for the role of a Gestapo agent, and he played the role with flair, smoothly attempting to outmaneuver his untrustworthy associate Armstrong and cooly exterminating anyone who obstructed his plans. 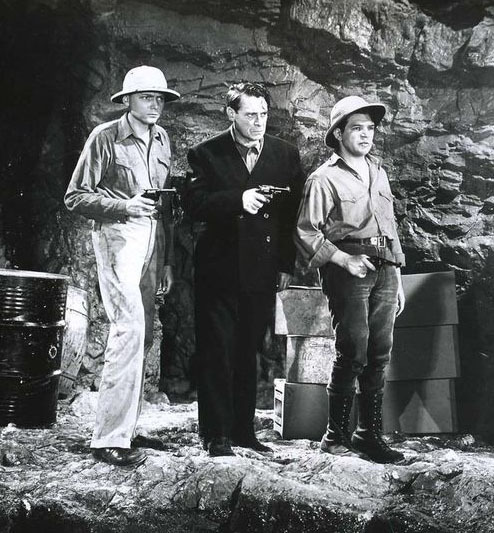 Above, from left to right: Louis Adlon, a murderous-looking Eduardo Ciannelli, and John Bagni face an offscreen opponent in Adventures of the Flying Cadets (Universal, 1943). 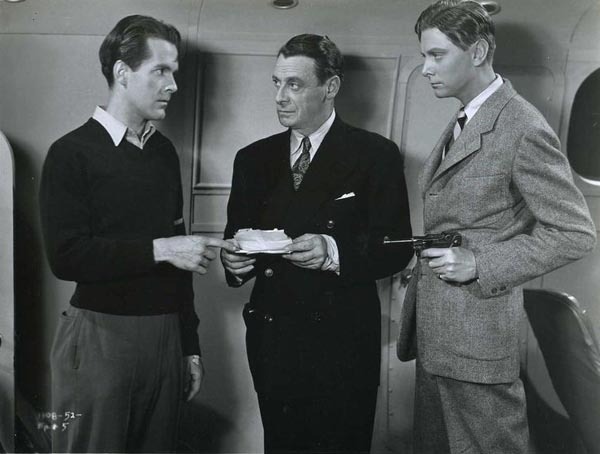 Above: Eduardo Ciannelli seems unperturbed by the questions of Johnny Downs (far left) and Ward Wood (far right) in Adventures of the Flying Cadets. Ciannelli remained a familiar presence in Hollywood pictures both big (A Bell For Adano, The Conspirators) and small (The Crime Doctor’s Warning, Dillinger) until the early 1950s, when he returned to Italy and began working in Italian films. However, he continued to make appearances in Hollywood movies throughout the fifties (the most notable of which was the 1958 romantic comedy Houseboat, starring Cary Grant and Sophia Loren). Ciannelli began increasing his American film work again at the end of the decade, beginning with a regular role (as a kindly jazz club proprietor) on John Cassavetes’ short-lived detective show Johnny Staccato. The later 1950s and the 1960s found him making occasional feature appearances in Italy and America, but working chiefly in American TV shows like The Untouchables, The Man From U.N.C.L. E., Dr. Kildare, and The Fugitive. He was now principally cast as either gruff but likable old immigrants of varying nationalities (as in Johnny Staccato) or as aging Mafia dons (as on The Untouchables or in the Kirk Douglas gangster film The Brotherhood). His last English-language film was the 1969 American-produced but Italian-filmed comedy The Secret of Santa Vittoria; he remained in Europe when this project was completed, appeared in a few more Italian films, and passed away in Rome at the age of eighty. Eduardo Ciannelli’s serial career was quite brief, and only one of his cliffhangers–Mysterious Doctor Satan–is well-known to the average serial fan. However, his performance in that chapterplay has been more than enough to place him high on most fans’ villain list. Many of the best-remembered serial villains utilized bizarre costumes or extensive makeup to accentuate their frightening appearance, but Eduardo Ciannelli was able to achieve a similar level of menace without any external assistance–partly because of his frightening face and voice, but principally because of the acting skill with which he utilized them. Above: Eduardo Ciannelli grins evilly as the Mysterious Doctor Satan (Republic, 1940). Acknowledgements: I. S. Mowis’s Internet Movie Database biography of Eduardo Ciannelli gave me some of the biographical information featured in this article. During the 1966-67 U.S. Network primetime television season Eduardo Ciannelli was experiencing something of a career resurgence with important guest assignments on THE FUGITIVE (“A Clean and Quiet Town”), THE MAN FROM U.N.C.L.E. (“The Concrete Overcoat Affair,” Parts One and Two) , THE GIRL FROM U.N.C.L.E. (“The Catacomb and Dogma Affair”) and THE TIME TUNNEL (“The Ghost of Nero”). It must have been a very happy and creatively satisfying time for the gentleman especially coming in his twilight years!